YHA London Oxford Street is all about location. As the name suggests, this hostel is just off Oxford Street in central Soho, a lively area of cafés, bars and shopping. This colourful hostel is frequently praised by Hostelworld guests for their clean and spacious rooms which include an individual light and power-point at each bunk. We like that this hostel is centred between three of London's most popular tube stations - Oxford Circus, Tottenham Court Road and Piccadilly Circus. None of our rooms are ensuite - showers and toilets are within easy access of all rooms. Due to the hostel location and layout of the building we would not recommend families bring children under the age of 14 here. YHA St Pancras, Thameside and St Paul's hostels are much better suited to families. Reception is on the 3rd floor with lift access from the ground - accommodation on this floor is limited. Please note: There is no interior lift access to rooms above 3rd floor. 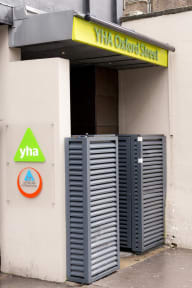 We apologise, but due to the building architecture we have no disabled facilities at YHA Oxford Street. YHA London Central has full disabled access and is our next nearest hostel. Towels are available to rent or buy from reception, as are padlocks and travel adapters. One of the nicest hostels I've stayed in! The location in Soho was perfect with lots of cafes, pubs and restaurants nearby. Staff were very friendly and gave us a warm welcome. Showers and toilets were perfectly clean and the rooms were comfortable. I highly recommend staying here to anyone visiting London! This place is beautifully located to everything in the city. You can easily walk to Trafalgar Square or Picadilly Circus. Close to bus stops, close to the Tube. Good places to eat nearby. I have already stayed a few times at this hostel. It has a superb location. The staff was always super friendly. You can find a small lamp and a socket next to your bed. There is a diva room to dry your hair or do your make up. This time I stayed in a very small room, so i couldn‘t give 10.00 in total. Hopefully next time. Amazing location, just steps away from major shopping street with bars and restaurants nearby. Easy access to get on and off the tube. Great separate stall bathrooms and very clean. Staff was super helpful and it looks just like the pictures. Also, very secure access and feels very safe both inside and around the building. Only drawback were the uncomfortable beds which is minor. Would definitely stay again! The staff were friendly and efficient. My quality of sleep was affected by the fact that the toilet was situated next to my room and it had a very loud hand dryer. The situation of the hostel was quite but thought should be put into reducing the noise from within the building. Clean place, hot water, but biggest issue is the almost absolute lack of WiFi. First, only the common spaces (not the rooms) have WiFi. Second, the WiFi in the two nights I stayed there only worked about 30% of the time, which is a real bummer when you don't have cellular data and its your only source of connection. What a GREAT hostel! The location was nice, people were respectful, and common areas were clean and comfy. My only complaint was about the wi-fi, which worked perfectly 25% of the time, kind of okay 25%, and not at all 50% (on the main level where wi-fi is advertised). There is also no public computer, so I ended up having to get an international plan with my cell provider, which was not in the budget. Only $25 extra for a few days, but still inconvenient. Would still recommend YHA! Thanks! Wifi only in reception area and kitchen... the rest is "good"
I stayed in the female dorm that was on the top floor. For me no elevator and no wifi in the room were the two things I did not like about the place. Otherwise the hostel is very good. The hostel was a little smaller than expected, the common areas were a little cramped and the place was noisy at night!